Using the straw carbonization furnace can solve the crop waste problem in a green and profitable way, because it can help you process those straw waste into useful biomass charcoal. In addition, its design accords with the environmental protection policy, so the plant is eco-friendly. The adoption of one fire, two-step method can save much energy during the biomass carbonization process. The carbonized straw can be fully recycled to useful biomass charcoal, which has a higher carbon content than that of common carbon. With more and more people have realized the applications of the straw charcoal, its price is also increasing. 1. The dryer and the crusher are necessary if the size of the straw waste is larger than 50 mm, and the water content of the straw waste is higher than 20%. 2. Put the straw waste into carbonization host, which is firstly heated by the LPG fuel and other kinds of fuel. 3. During the straw carbonization process, the produced combustible gas can be recycled to heat the carbonization host and dry the raw material. 4. You can also get wood tar and wood vinegar after you process the combustible gas with the condenser. 5. The straw charcoal will be discharged after cooling system, and its temperature is around 30 degrees, so the charcoal will not be self-ignited. 1. It can to improve the quality of the soil. When the soil is much more fertile, the out yield of the land can also be higher. 2. The straw charcoal is free of odor, toxic and smoke, so it is good for barbecue, and other usage for food industry. Traditionally, the waste straw is burned after harvest. But burning method does not accord with the environmental protection policy because it is easy to cause air pollution. 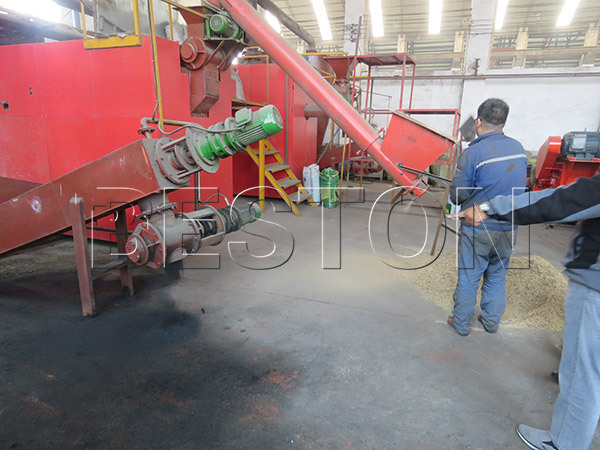 Using straw carbonization furnace to process the straw waste into charcoal is an innovation, and it is also suitable for bamboo charcoal making, sewage sludge treatment and other waste treatment field. Moreover, its models are various according to the capacity. So if you want to know more, you can feel free to contact us. We will provide you with the best service and products.